An unmanned Russian cargo ship carrying a fresh load of supplies is on its way to six crewmembers living and working on the International Space Station. 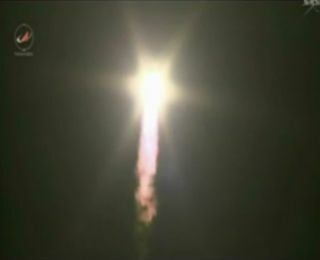 The Russian Progress 55 spacecraft launched atop a Russia-built Soyuz rocket from the Baikonur Cosmodrome in the Central Asian nation of Kazakhstan Wednesday (April 9) at 11:26 a.m. EDT (1526 GMT), 9:26 p.m. local time in Baikonur. The Russian Progress vehicle is expected to dock with the space station about six hours later at 5:16 p.m. EDT (2116 GMT). You can watch the docking live on Space.com via NASA TV. NASA coverage of the docking starts at 4:45 EDT (2045 GMT). "Liftoff of the ISS Progress 55 resupply ship beginning a fast track rendezvous to the International Space Station," NASA spokesman Rob Navias said during the NASA TV broadcast. When Swanson, Skvortsov and Artemyev launched from Baikonur about two weeks ago, they were expected to make an express trip to the station like the Progress today, however, due to a slight issue with the positioning of the Soyuz after launch, they instead took two days to dock with the space station. Russian officials do not expect that the issue will be repeated with Progress today, Navias said on NASA TV. The Progress 55 launch comes just two days after the robotic Progress 54 departed the space station. Progress 54 undocked from the Pirs docking compartment (making way for the Progress 55) on Monday (April 7) after being attached to the station since February. The Progress 54 vehicle has now been moved away from the outpost for tests before its planned de-orbit that will lead it to burn up in Earth's atmosphere.